In light of the recent news reports of lead contamination in the drinking water in Flint, Michigan, awareness of the condition of our drinking water has been heightened in government, in water supply systems, and in the public. In 2014 the city of Flint, Michigan, temporarily switched its water source from Lake Huron, supplied by the Detroit Water and Sewerage Department, to the Flint River, an inland source that can cause greater challenges for treating water than water that is from the Great Lakes. Flint treated the river water, but the water reaching people’s homes was corrosive. Water that’s corrosive can allow water in lead service lines – which connect water mains to household plumbing – to absorb lead from the lead service lines and plumbing. The result can be unacceptable levels of lead in the water that people may consume. A primary mission of the Kentucky Division of Water is to ensure that safe and reliable drinking water is delivered to the citizens and businesses of the Commonwealth. As a part of that mission, the Kentucky Division of Water (DOW) reviews and takes action on data reported by Public Water Supply Systems (PWSS’s) on a regular and routine basis. Water quality data submitted to DOW from Kentucky’s water supplies indicate that lead levels in Kentucky’s drinking water are consistently within ranges considered safe by the Environmental Protection Agency (EPA). Lead is a toxic metal that, when ingested, can cause numerous health problems, including lead poisoning. Lead ingestion can result in impaired cognitive development in children, impaired kidney function, cardiovascular problems and numerous other effects, and may result in death in extreme situations. The sustained occurrence of lead in drinking water can present a significant risk to public health. 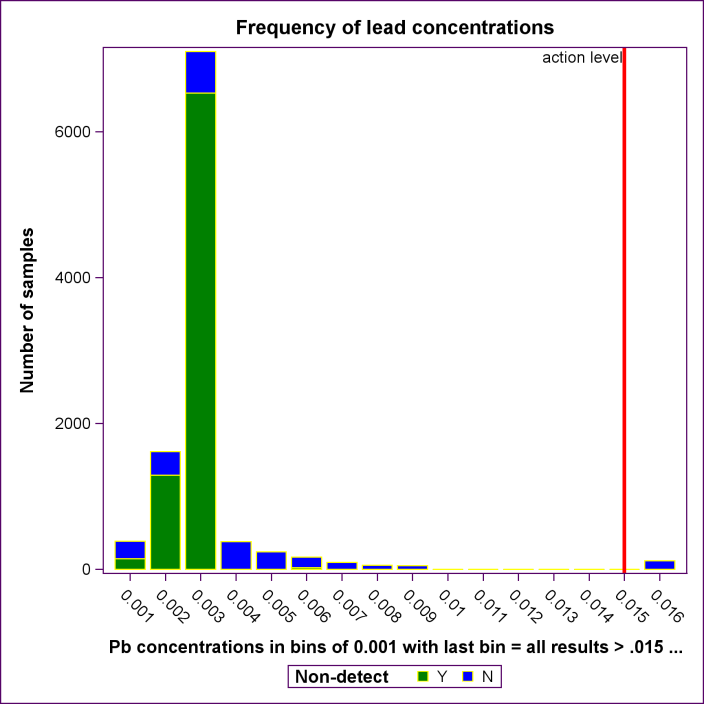 Lead is not common among waterborne contaminants and is generally not present in levels of concern in the source water of a public water supply system. Rather, the occurrence of lead in drinking water is primarily due to older distribution pipes that may contain lead, which may then dissolve into the water as it passes through the distribution system. Lead service lines, connecting water mains to houses, are another source. Inside the home, lead pipes and solder may contribute to lead contamination, as water sits idle in these pipes while the system is not in use in the home. To account for these potential concerns, public water supply systems, with oversight by the Division of Water, work diligently to ensure the water chemistry within the distribution system will not dissolve harmful metals into the final publicly used water. Public water systems in Kentucky have also been monitoring water within households since the implementation of the federal Lead and Copper Rule in the early 1990s. Lead levels are sampled regularly by public water systems at residences and businesses to ensure drinking water is safe. The results of these samples are reported to the residents and businesses sampled, as well as water system customers. Sample results are also provided to the DOW and EPA for review and action, as appropriate. The Lead and Copper Rule requires water systems to sample a number of households in their distribution system, based on population. The sampling focuses monitoring on those households most vulnerable to lead and copper contamination, such as single-family homes that contain copper pipes with lead solder, contain lead pipes, or are served by a lead service line. Sampling is conducted over two consecutive six-month periods. If no action levels have been exceeded, sampling is reduced to annual sampling for two consecutive years, and then every three years if no issues are identified. The federal Lead and Copper Rule established that a public water system’s monitoring results must be at or below the lead action level to avoid further monitoring, treatment and other actions. The action level is exceeded when more than 10 percent of the water system’s samples exceed the 15 parts per billion threshold. Exceedance of an action level determines whether systems need to undertake additional monitoring and treatment technique requirements. Over the past four years, the 409 Kentucky public water systems subject to the federal Lead and Copper Rule have collected, tested, and reported approximately 10,380 water samples for lead at households and businesses. More than 77 percent of these samples had no detection of lead, while approximately one percent of these samples exceeded the action level of 15 parts per billion established by EPA in the Lead and Copper Rule. Based on the reported data discussed above, 76 public water systems had a cumulative total of 107 samples over the four year period where lead was detected at a concentration equal to or greater than 0.015 mg/l. The vast majority of these detections were not at a frequency that required additional action under the federal Lead and Copper Rule. However, three of these public water supplies did exceed the federally established action level for lead at a frequency requiring action. As a result, under Division of Water oversight, these systems were required to notify the public via newspaper and other media, conduct sampling of their source water, conduct additional and broader water quality monitoring at the treatment plant and in the distribution system, including restarting lead monitoring, and to formulate a plan and take action to reduce lead levels. All of these public water systems have returned to compliance. Currently there are not any Kentucky facilities out of compliance with the federal standard for lead. In Flint, Michigan, changing water sources created a situation where lead became a significant concern. In Kentucky, if a water system intends to use another source of water, even a new well, DOW engineers review the plans for treating the water and examine corrosion-control methods that could be necessary to ensure that the water does not leach metals, such as lead and copper from pipes, within the distribution system. To avoid unintended consequences from source or treatment changes, any such changes by a water system require DOW’s review and approval before they take effect. Pilot studies may be required as part of the review and approval. A new source of water and/or treatment change also brings about changes in the monitoring frequency required for the system for examining lead levels in the water. DOW technical personnel also review water quality reports, which follow each round of sampling by a system. Based on these reports, the DOW may issue recommendations to address any possibility that the water has the potential to leach materials, including lead, from service lines and household plumbing. Even though Kentucky drinking water systems have been very successful in avoiding significant lead concerns, there is always room for improvement. The DOW will continue to work with drinking water industry stakeholders and other state agencies to review lead related protocols to ensure changes in source water and treatment processes are appropriate and sufficient to avoid unintended consequences from source or treatment changes. In addition, the Division of Water will be discussing with EPA the need to evaluate the Lead and Copper Rule to ensure that the rule’s provisions and requirements are adequate to protect public health. While the existing rule has provided a good framework for identifying and responding to lead concerns, the events leading to the problems in Flint, Michigan have shown that there is reason to evaluate the rule to ensure its continued protectiveness. The DOW will also continue to work with the Department of Public Health to educate people about what lead levels mean, explain how they can sample their home’s water, and to provide technical assistance where needed. To learn more about the EPA Lead and Copper Rule, go here to access it online. For tips from the EPA about dealing with lead in your home, and specifically in your tap water, go here for a link to the EPA website.